In which we review the sequel to Mars Evacuees, one of our favourite Middle Grade reads of 2014. 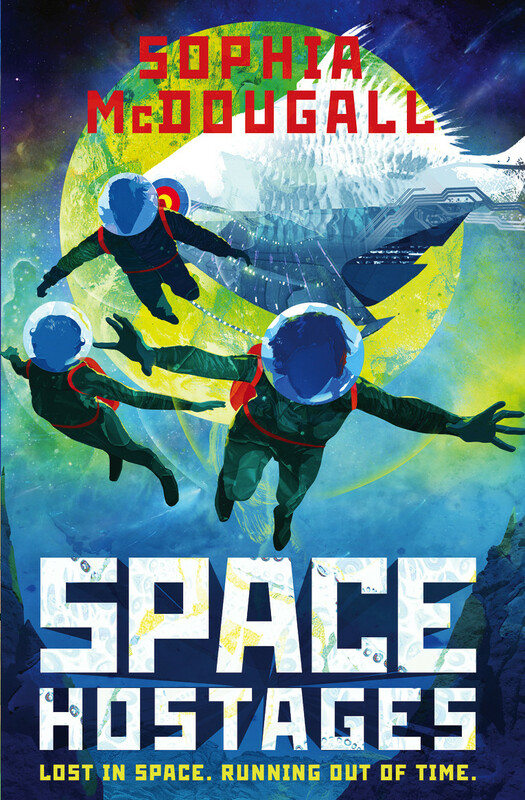 From bestselling UK author Sophia McDougall comes Space Hostages, an intergalactic quest full of humor, adventure, and, of course, aliens! This hilarious middle grade sequel to Mars Evacuees is perfect for fans of Artemis Fowl and packed with nonstop fun. Young Alice Dare is relieved that at last humans and the alien Morrors are now living peacefully together on Earth. But with an influx of too many Morrors, space is getting a bit tight. To make room for all the Morrors, they’ve been terraforming a cold little moon in the Alpha Centauri system—and Alice and her friends are invited to the inauguration of the Morrors’ new home! But just as they’re approaching Alpha Centauri, the kids are kidnapped by the hostile Krakkiluks and must save themselves—and the Eemala people in the process! …and The Plucky Kids Of Mars are back in this sequel to the Most Excellent Mars Evacuees and this time around they go off to have adventures in outer outer space (literally, at that one time,) and meet different aliens – friend and foe – whilst saving Earth. Again. And it just so happens that Alice Dare, slightly bored on Earth after all the shenanigans in Mars, is invited to go on a Trip of a Lifetime with her friends to attend the inauguration of the Morror’s – Earth’s former foes-turned-allies – new home on a cold moon far, far away when they are kidnapped by hostile aliens who say they are trespassing on their Empire. And it’s a truth universally acknowledged that second books are difficult things to do well especially when the first ones are so freaking good but Sophia McDougall really pulls it off by amplifying the danger she puts this kids through whilst simultaneously expanding the known universe and keeping a close watch on what makes the books work, most specifically the close knit relationship between the characters. And if the first book was slightly dark and put these young teenagers through the wringer, Space Hostages takes that and doubles it by adding villainous aliens who hate children spawn and throw them THROUGH THE AIRLOCK INTO SPACE WITHOUT OXYGEN like it’s no big deal. Also, terrible parenting. And much of this series’ success depends on the voice i.e. the narrator’s voice and Alice’s remains a delightful mixture of childish impetuosity and snarky distance and it’s delightful to the extreme. And this is why, if there is one thing to criticise about this book is that a choice is made to split the group into two which makes sense from a storyline point of view and it works to a degree but the viewpoint narration also changes by default and that second group formed by Noel and Thsaaa’s has a different voice from Alice’s – as it should be – but unfortunately that voice is not as engaging. And there are things that are so hilarious because they are completely absurd like that one time when the kids are in Mortal Peril and Really, Really Need To Find A Way Out and Alice gets completely worked up about Medical Ethics and I was in reading it on the bus and I started LOLing which was quite embarrassing, thank you very much, book. But at that same time – and this is great, by the way – inasmuch as that scene was hilarious and absurd it also serves to reinforce the friendship and bond between Alice and Josephine. Like I said: this series juggles the personal and the societal really well. Because on top of everything else – and lest we forget – we also get politics and the topics of imperialism and colonialism and fight for freedom and independence thrown in for good measure. And the latter is super important because even though our Plucky Kids, as good heroes, do help out the independence of a planet, they only slightly do so since the independence/resistance effort was already in place. And when did Goldfish become one of my favourite characters? It is so earnest and I don’t know but oh, boy do I want one. Can someone please come up with a way to market Goldfish toys? THE PLUCKY KIDS FROM MARS ARE BACK! THE PLUCKY KIDS FROM MARS ARE BACK! Oh, Plucky Kids, how much do I love you? And your goldfish teacher? And your surprisingly death-laden shenanigans? Space Hostages continues the adventures of Alice Dare–now a published author and minor celebrity for her memoir and role in the Mars disaster–as well as her friends. This time around, the kids are reunited as they head for Ausalawa-Moraa, a newly terraformed planet made hospitable for the Morrors (Mo-raaa uha-raaa, technically) near Alpha Centauri. Alice craves adventure and to be reunited with her friends–especially best friend Josephine. Of course, being that these are the Plucky Kids from Mars we’re talking about, things don’t go so smoothly. A new alien species enters the picture, kids are thrown out the airlock without oxygen and forced to decamp on a strange planet, and all sorts of other shenanigans ensue–which could lead to intergalactic war. …but not if Alice, Josephine, Carl, Noel, Thsaa, and a robot goldfish have anything to say about it. This second installment of the delightful Mars Evacuues series is every bit as awesome as the first. Not only are we reunited with some truly wondrous middle grade characters–who are funny, smart, and ring as entirely genuine–but we also expand the world, err or universe, that they inhabit. We also see these character grow, and that is the best thing of all. I love seeing how Alice’s book changes the relationship between herself and best friend Josephine, how the two of them struggle to keep their friendship going despite being so far apart and focused on such different things, with Jo devoted to work on her advanced baccalaureate degree and all. But, as Ana says, really the most delightful thing about Space Hostages is the delightful narrative voice. Though this book does split its protagonists apart, and Alice will always be the most compelling narrator of the series, I love the oral history/recorded log approach to storytelling and found it exceedingly clever and entertaining. Speaking of clever and entertaining, can we talk a little bit about the hilarity and awesomeness of this book? Space Hostages reminded me so much of Futurama, and this is a compliment of the highest order for me because for all of its flaws, I love Futurama dearly. It especially reminded me of Zapp Brannigan, of the wonderful Doctor Zoidberg, and, of course the claw-plach episode. More than anything, the best part of this series is the fact that it is incisively questioning bigger themes–sexuality, marital expectations, concepts of gender, imperialism, tolerance, and colonialism. It’s all very, very good. I’m so glad you liked it because I’ve been looking forward to it for ages and it would have been sad for me if you’d thought it wasn’t good….